The Rebel Sweetheart. : Spotlight | COSRX Low pH Good Morning Gel Cleanser. 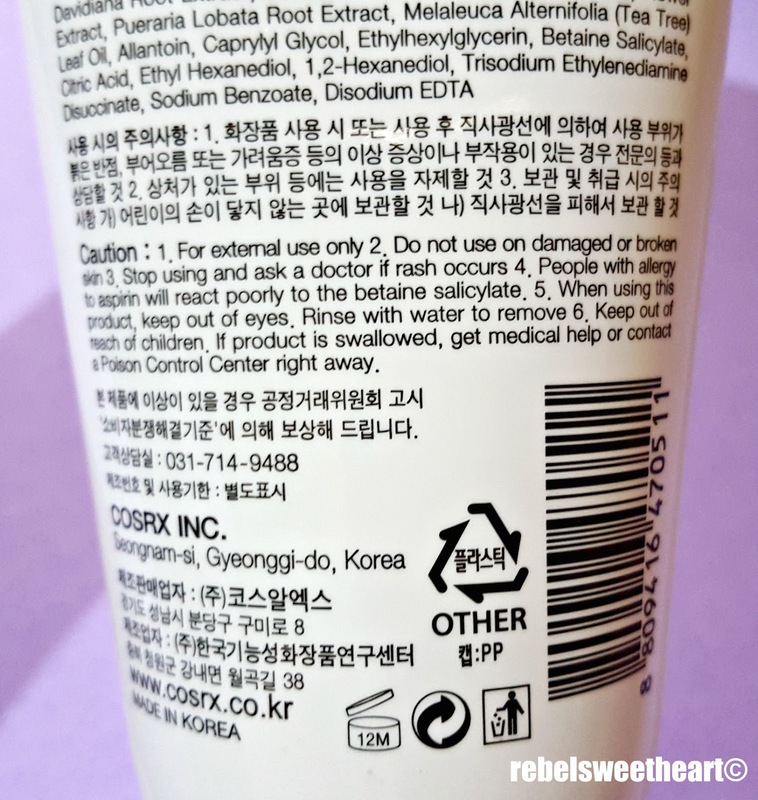 Spotlight | COSRX Low pH Good Morning Gel Cleanser. 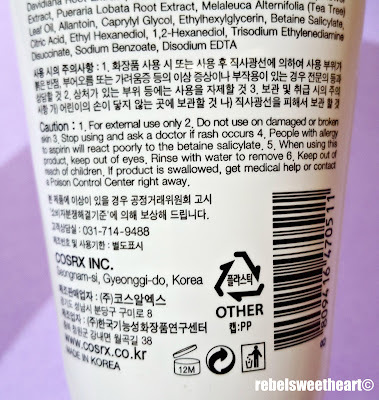 I have recently been introduced to Korean beauty brand COSRX, thanks to a friend who's an avid user of the brand and vouches for the efficacy of its products. At first, I had no idea where to buy this in Korea - until another friend told me that they're sold in ALand, a multi-brand clothing and accessories store with branches in Myeongdong, Hongdae, and Apgujeong among many others. I made my COSRX purchase at the ALand building in Myeongdong (located near the Onitsuka Tiger store), and my loot included the Low pH Good Morning Gel Cleanser. 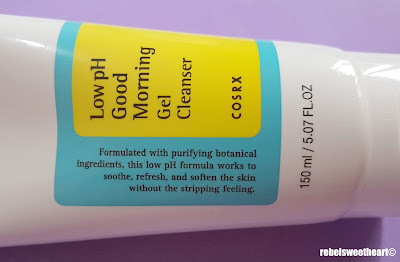 COSRX Low pH Good Morning Gel Cleanser. COSRX, whose name is derived from the word 'cosmetics' and the symbol 'Rx' denoting prescription, takes pride in their standard of 'good cosmetics' - more natural (minimized refinement of products found in nature) and more science (addressing skin concerns with a scientific approach). 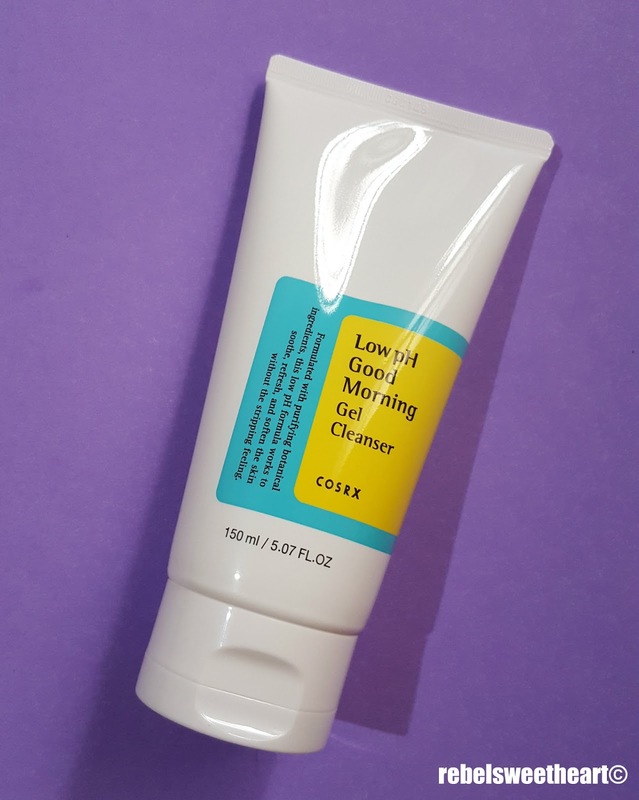 The brand is also known for its minimalist packaging, as evidenced in this tube of the Low pH Good Morning Gel Cleanser. The packaging is simple, straightforward, and speaks for itself. You'll find pertinent information at the back of this 150 mL tube - product description, usage directions, note of caution, and list of ingredients in both English and Hangul. 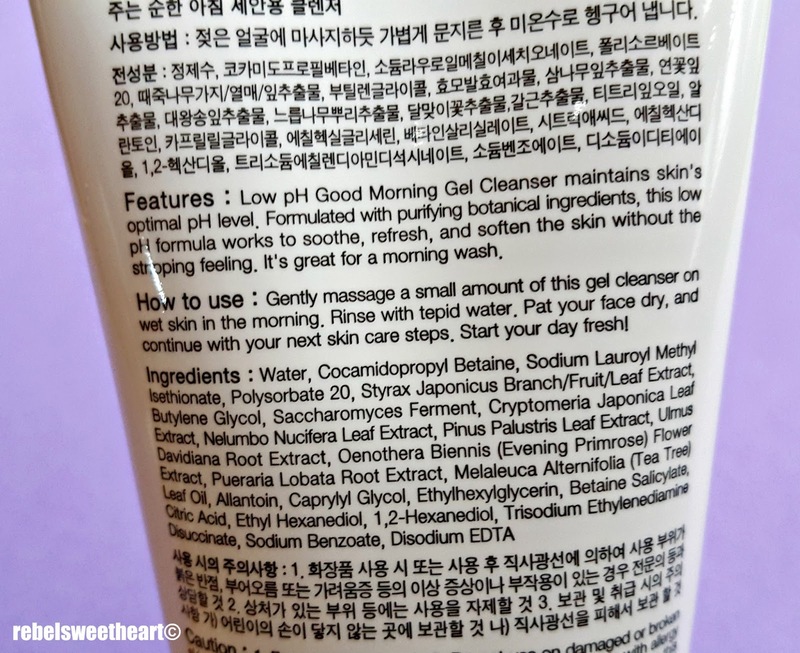 One of the many things I love about this cleanser is that it contains Saccharomyces Ferment - the same fermented yeast found in the Missha First Treatment Essence. Dubbed as 'the mother of all K-beauty ingredients', Saccharomyces Ferment increases the rate of metabolism which leads to healthy, hydrated, and youthful skin. It also contains Betaine Salicylate, a natural skin conditioner derived from sugar beets. 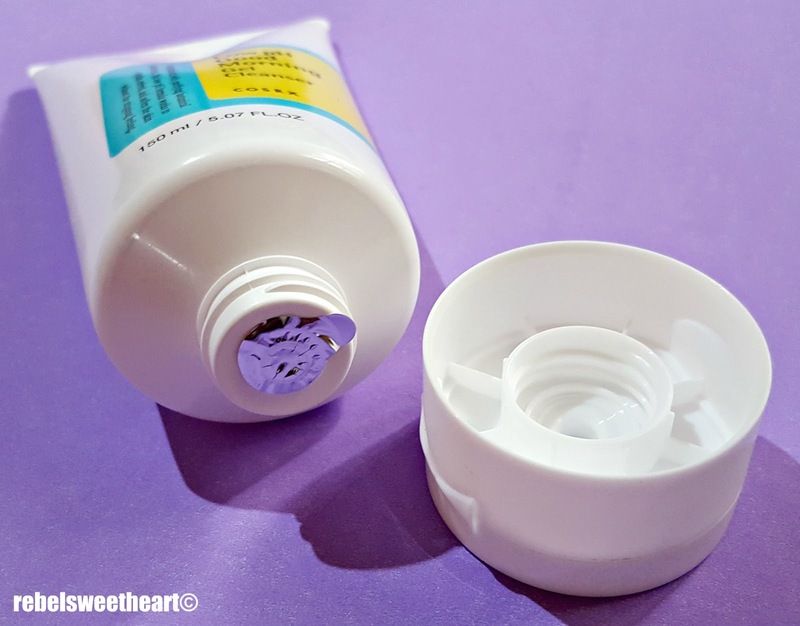 It's a kind of Beta Hydroxy Acid (BHA) which works by deep cleaning the pores and removing all the gunk (oil, dirt, all that icky stuff) built up inside. This ingredient is highly-preferred by those with oily and acne-prone skin, though you have to use it caution if you're allergic to aspirin. Now the key feature of this cleanser is its low pH level. By nature, our skin's pH level is a little acidic (around 4.5). Cleansers, on the other hand, tend to be more alkaline (pH level ranging from 6-12) because alkalinity is what helps remove grime and dirt. However, this alkalinity could cause dryness and irritation in the skin which can eventually lead to acne, breakouts, and other skin issues. Screw cap + sealed opening. COSRX addressed this issue by developing the Low pH Good Morning Gel Cleanser. 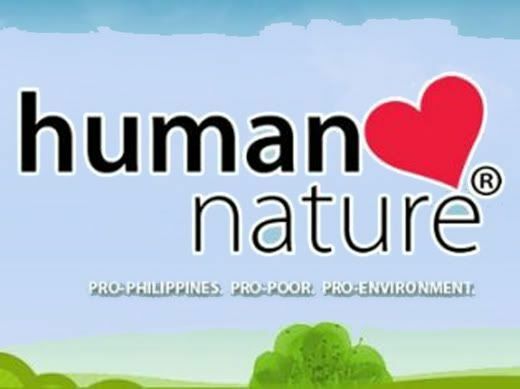 Its pH level ranges somewhere between 5.0 and 6.0, an ideal pH level for a cleansing product. Clear and colorless with a gel consistency, this cleanser lathers quite well even with just a small amount. It cleans the skin thoroughly without the drying feel. It has an herbal, somewhat medicinal scent, which I attribute mainly to its tea tree component. I'm not too fond of the scent, and thankfully it doesn't linger on the skin. Building up a nice lather. 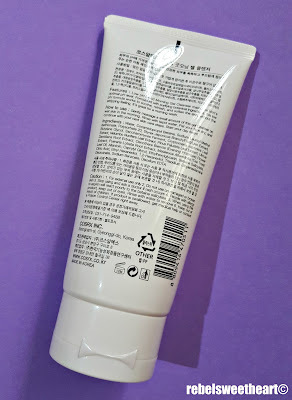 I've been using this product as my morning cleanser for the past two months (relegating the Innisfree Jeju Volcanic Pore Cleansing Foam as my night cleanser), and I must say, using a low pH cleanser really does make a difference. I feel like my skin has become a cleaner, clearer, and softer canvas for the rest of my skincare routine. I have not had any allergic reactions either, so I would recommend this product to those with sensitive and troubled skin. Thanks for the in-depth explanation of this product. I love that you explain some of the ingredients in detail instead of just saying it's great. I wonder if I can get this in the US? Hmm. Korean beauty products are the best by far. I have my friend who lives in Seoul send me products every so often. They do the best job at cleaning my face and keeping it looking fresh and healthy! Sounds like a great product. Wonder if they'll ever come to the U.S.?! The Cosrx products sound interesting. I love that they are leaning more towards natural ingredients. Low pH Good Morning Gel Cleanser sounds like something I would really use. Thanks for sharing this awesome product. Such a nice explanation of this product. I like how you explain each detail of this product. I will definitely check out this product. The results look really great. Skin care products are the trend nowadays. And it is really good to take good care of our skin. I don't wear a lot of make-up, or I don't at all. But I do love taking good care of my skin. 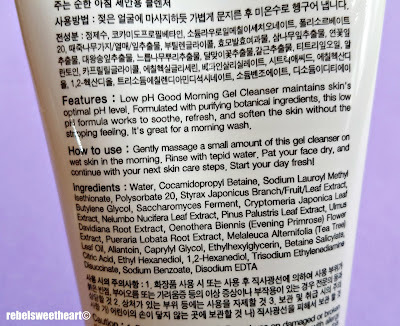 This sounds like a lovely product, especially since it's from Korea! Koreans know how to take good care of their skin.